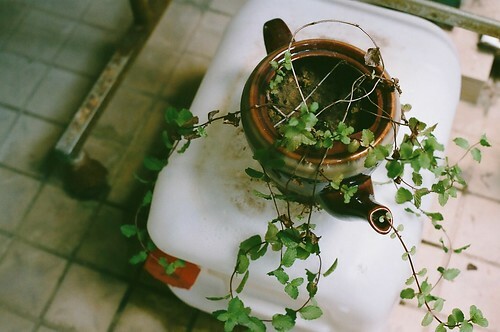 Feeling a bit like this plant at the moment, sort of all over the place and messy. I'm off to Korea (again!) for a short trip next week and I can't wait to revisit familiar neighbourhoods and discover new ones! My great excuse for my lack of productivity thus far has been that 'I need a break!'. Hopefully, after this trip I'll be all out of excuses and will come back with a suitcase full of new clothes, some new Korean words and lots of fresh ideas! A lovely wedding by the sea (found via A Cup of Jo). Love the result of this heart cut-out DIY project. When illustration and design seamlessly combine. How to turn your old flats into glitter flats! A new clothing label I love. Tuesday taste test, a collection of neat things from Etsy. A garden in a cup. What ideas or images have you been inspired by lately? I'd love to hear about them! Love that garden in a cup! So cute. P.S. So glad you enjoyed that Reptilia cover! I've been listening to it all week. Can't stop! A cup garden is such a good idea, isn't it? And yes, I enjoyed that cover immensely, thank you. I'm gonna go check out more of their music!